Sparkling Blood Orange Cocktail is a fruity & fizzy punch that’s great for brunch or sipping with friends! A light & refreshing punch with a beautiful blush! Get ready to want brunch every day of the week! 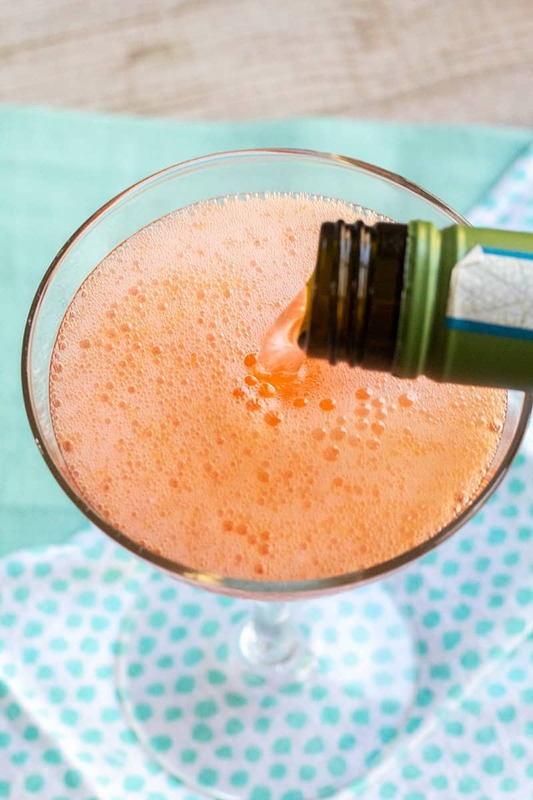 While I love a good mimosa or bellini in the morning as much as a next gal, this Sparkling Blood Orange Cocktail is a step up from your average morning fare that’ll get you into that lazy Sunday groove. National Prosecco Day is coming up on August 13th, and fab brunch cocktails are a must-have to celebrate!! 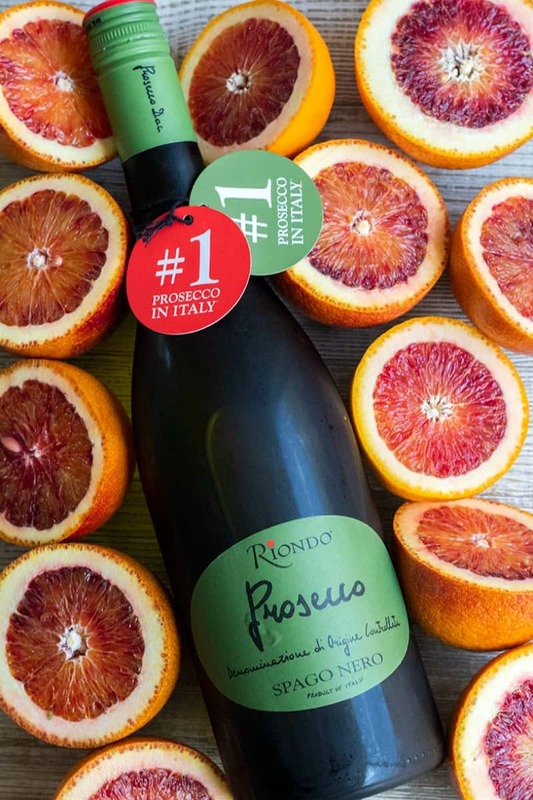 These bubbly prosecco cocktails start with Riondo Prosecco, the #1 prosecco in Italy. I’ve been a prosecco fan for years. Champagne is fine, but I’ve always gravitated towards Asti and prosecco. I like that Riondo Prosecco has a crisp, clean finish that doesn’t give my mouth a sharp bite. It’s a smooth prosecco that’s great any time of day you’re ready to treat yourself. Bonus, this prosecco is totally affordable. It’s not just a “special occasion” drink anymore. It’s an anytime I need a little fizz in my life drink. My favorite time to enjoy prosecco is during breakfast, which makes the screw-top cap of Riondo Prosecco awesome in my book. I’m not the strongest gal first thing in the morning so having a screw-top option vs the traditional string and cork sparkling wine bottle closure is wonderful. Riondo does have a string and cork closure Spumante bottle, but the screw-top prosecco is my go-to. We usually laze around on the weekends so by the time we’re getting to breakfast it’s definitely considered brunch. And as we all know, brunch without booze is just a sad late breakfast. Quite a few morning cocktails start with orange juice, and rightfully so. 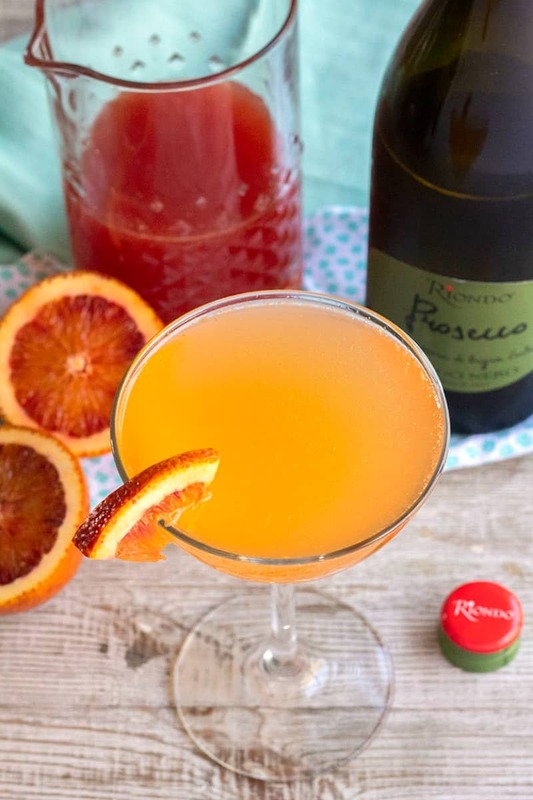 Since blood oranges are totally on trend right now, I decided to get a little fancy with my Riondo Prosecco Cocktails and get some of those red beauties for my drink! Blood oranges are a variety of orange with a crimson, almost blood-colored flesh. The outer rind may also have darker red coloring mixed with orange. Blood oranges have a unique flavor compared to other oranges, with distinct notes of citrus and a raspberry-like flavor. 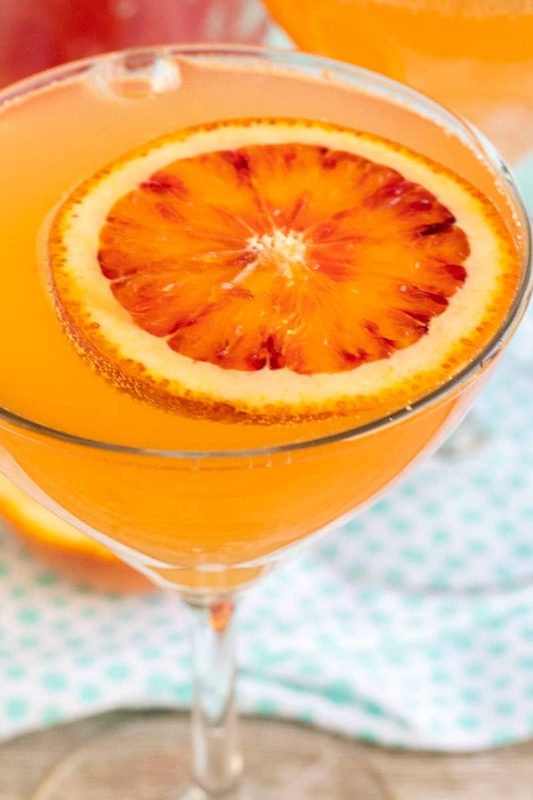 This easy cocktail is like a screwdriver and a mimosa had a love child that wanted to spread joy to brunch everywhere! 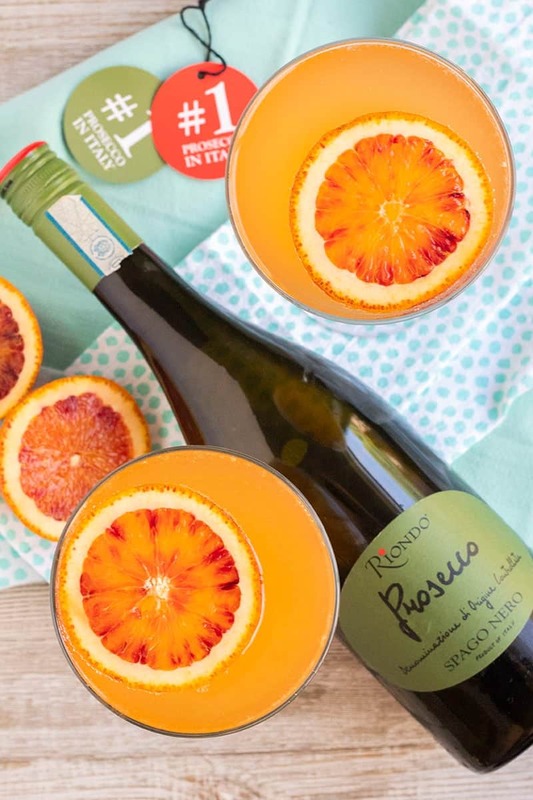 The Golden Delicious apple, pear, and acacia blossom flavors in the Riondo Prosecco pair beautifully with the fresh blood oranges and orange simple syrup I used. 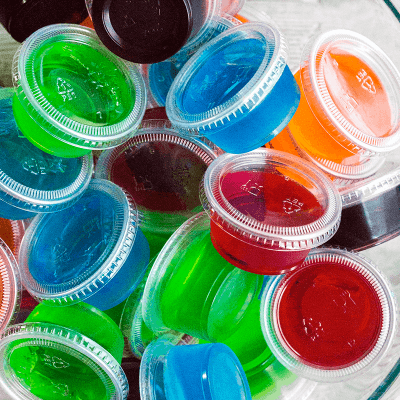 You could even boost the flavor and color with a hibiscus simple syrup instead of orange. I really love the gorgeous blush color from the fresh orange juice. It starts out a vibrant reddish-pink that’s diluted by the prosecco to an orange-tinted pink that begs to be adored. You can garnish your blood orange cocktail two ways. Option one: thinly slice your blood orange and pop a whole slice in the glass to float on top. Option two: cut a slightly thicker slice of the orange and then cut the slice into halves or quarters and stick it on the rim of the glass. There’s no wrong answer here, but I do love the whole slice look. I can usually find blood oranges at my local grocery store pretty easily, but if not, the specialty store almost always has them on hand. If you can’t find blood oranges anywhere, you can substitute navel oranges. However, you’ll want to play with the amount of simple syrup you use as the navel oranges tend to be more tart than blood oranges. Then add your vodka and Riondo Prosecco and you’ve got a batch of Riondo Prosecco Cocktails ready to go whenever you are! 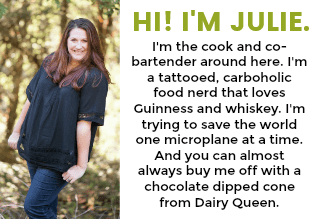 I think my favorite thing about this cocktail is that it’s a make-ahead recipe that also makes a big batch of drinks. 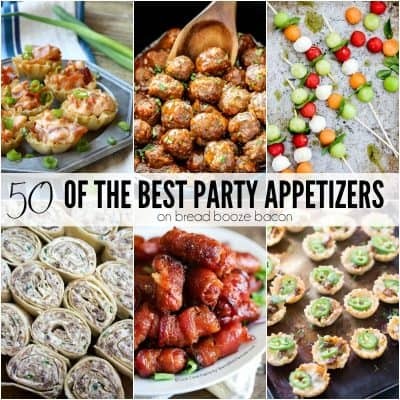 One recipe makes seven cocktails and it’s super easy to double it up if you’re serving a crowd. The mix is made separate from the prosecco so you can prepare the mix whenever you want and store it in the fridge in an airtight container. Then when you’re ready to serve, pour some of the blood orange mix into your cocktail glass, and top with Riondo Prosecco. It’s that simple! Who says home bartending has to be hard? Not me! This Sparkling Blood Orange Cocktail is the embodiment of the easy Italian lifestyle right in my own kitchen and I love it!! 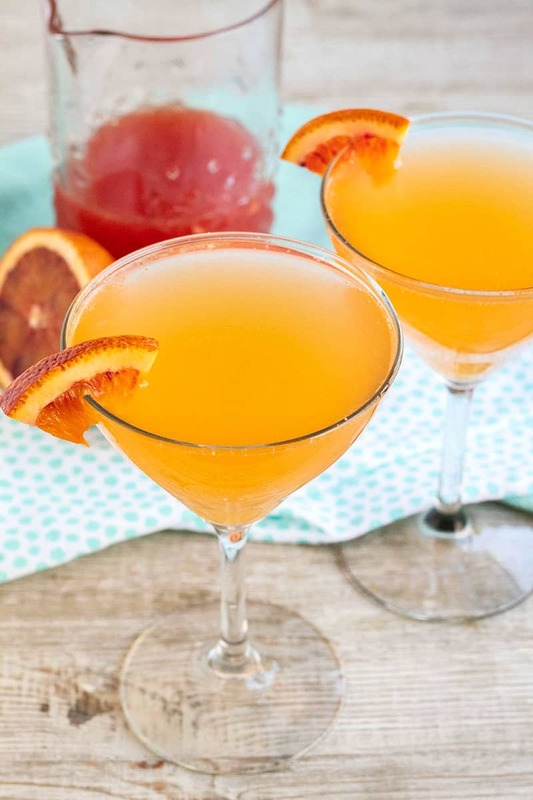 Sparkling Blood Orange Cocktail is a fruity & fizzy punch that's great for brunch or sipping with friends! A light & refreshing punch with a beautiful blush! In a cocktail mixing glass, add blood orange juice, vodka, and simple syrup. Use a bar spoon to stir together. Pour 2 ounces of blood orange mix to a 6-ounce cocktail glass. I love a curvy coupe glass for this recipe. Fill the glass with chilled Riondo Prosecco, about 4 ounces. Garnish with a whole blood orange slice floating in the glass or place a 1/4 slice wedge on the rim of the glass. Serve immediately. I like to strain my orange juice one more time after juicing to remove as much pulp as possible, but this step is totally optional.